That time of the year again: spring is on its first stages, birds sing, and everybody is looking for warmth and sunshine to enter their lives. 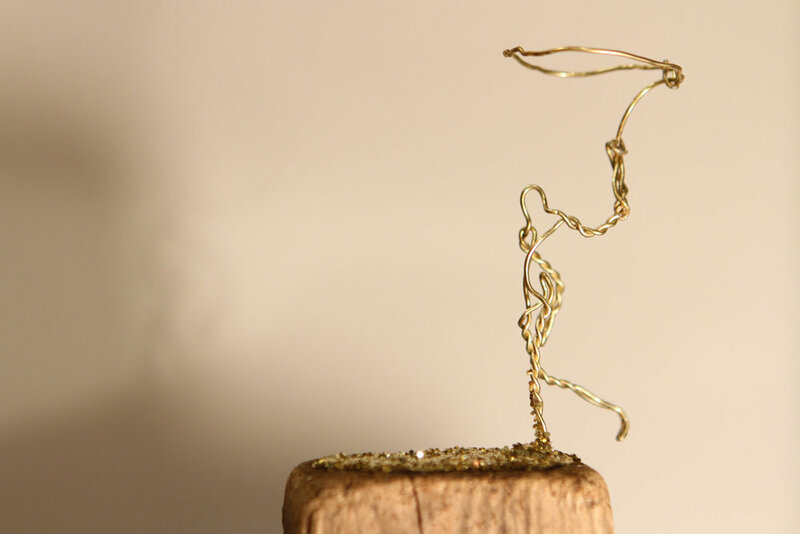 Another addition to the champaign bottle's cork-wire sculptures is " Ample-bosomed, wired lady defies gravity". Approx 3.5 inch square base, 5 inch tall. #veerapfaffli #scavengerart #trashsculpture available for $75 from veerapfaffli@gmail.com. Posted on February 14, 2018 by Veera Pfaffli. With heavy hearts, we had to let our beloved cat Mr. Mango to sleep away to eternal sleep last weekend. This small memory block pays respects to all importants that have left us | 5x5x1.5 inch canvas block, acrylic, embroidered glass beading for braille code | $75 plus shipping, contact Veera for more info. Posted on January 17, 2018 by Veera Pfaffli and tagged brailleart veerart braillebeading veerapfaffli. When there is not a fifteen minute gap to stop and sit down in a day, it is time to admit that you have to change your schedule. Or work. Or life. Whatever you do, don't keep pushing without a change: long term sleep deprivation can cause lifetime long insomnia problems, and you are not exactly living your life if you only see your family 15 minutes a day (even though that is enough to check that everyone has clean underwear and snacks to go). Remember that a smile goes a long way, and sometimes you have to forgive yourself and let go if you have hogged too much work to execute. People make mistakes and so do you (and me). So let's learn to say no, give more hugs, and take care of the poor burnoutosaurus. (By the way, he is available for a good caregiver for $75, contact me if interested). Posted on October 20, 2017 by Veera Pfaffli. Early morning braille embroidered memory block. Yes, I call it a memory block: the moment in a summer morning, when sun rises, humidity moves visibly in the air, and world seems so imaginably beautiful. I tried to capture the colors of it, coming down to yellows and oranges and the overpowering white light that the Mother Nature transfers in the sun rays. | 8x8x1.5 inch canvas block, acrylic, embroidered glass beading for braille code | $125 plus shipping, contact Veera for more info. Posted on September 20, 2017 by Veera Pfaffli and filed under braille code painting and tagged veerapfaffli braille art mixed media memory block. Small 20 cm square (8in sq) framed canvas block with white and metal-enhanced pattern sends a message with a lot of hope: a wish for a better tomorrow. This beaded Braille writing, typing to mo rr ow in four rows is a symbolic reminder that we do have reason to wake up and get going: to preserve our children some of the Mother Nature in a hope of improved, healthy future. This block was created as a gift, however, requests for other hand created, embroidered or other Braille messages are welcomed to be commissioned, prized for this size in $150 range. Posted on July 11, 2017 by Veera Pfaffli. New Summer in a Jar -design celebrates the beauty of the summer as this has been the coldest one I can remember, beginning from my childhood. Nevertheless, the traditional flowers still show up and butterflies as well, awakening summer feelings regardless of the temperature. Displaying Finnish flowers I shot around my cottage premises from June, Summer in a Jar literally preserves memories from the beauty of the nature, including a new species that I learned, karttaperhonen or orange and brown butterfly. Design is available printed on notebooks, canvas, fabric, throw pillows under $20 and even on a duvet, delivered anywhere in Europe or USA. Posted on July 7, 2017 by Veera Pfaffli. Some weeks are just like quicksand: no matter how much you try, in you start to sink. 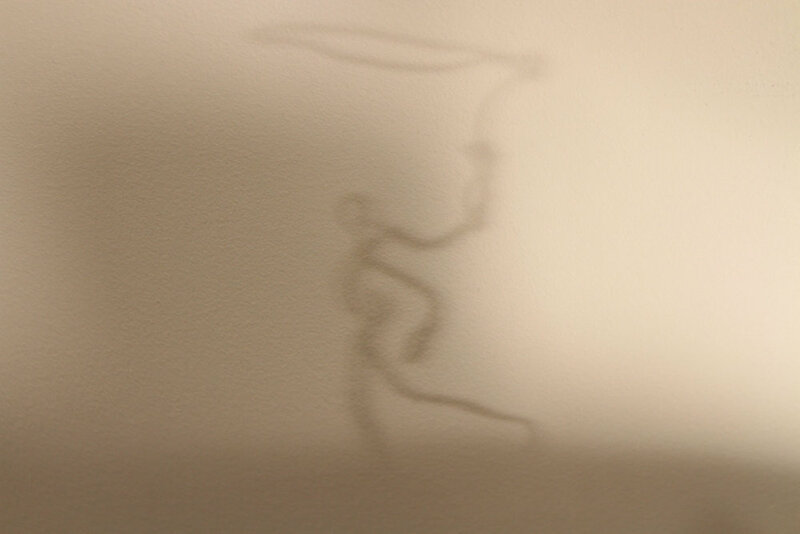 That's why another creature made from a found champagne cork wire came alive: a lassoman is about to sink in, but he has his lasso in the air. Anything can happen - just like in real life. Lassoman in quicksand is under 4 inches tall, his platform is made of 2x1 driftwood piece, and he is available for $50, contact Veera if interested. Posted on April 9, 2017 by Veera Pfaffli. 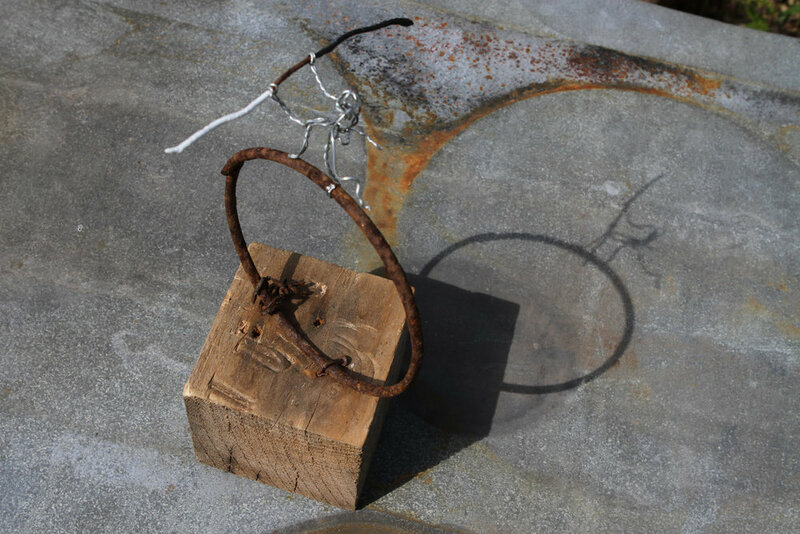 With a mirror reflecting the viewer's eye when peeked into from above, this tornado rises sturdily from a concrete base and simply makes its statement: this is life. Created from 14 gauge wire, red wireo wire, a inner stud from a broken umbrella handle, used mirror from a cosmetic case, concrete base poured into a coffee can mold, and finally topped with a white miniature dove rising from the storm, this is what the life basically is. Turmoil and getting through with it. Size approx 9 inches in diameter and 16 inches tall, this heavy statement is available for $75 plus shipping. Posted on March 27, 2017 by Veera Pfaffli. Sometimes life happens more than other times - In my case, theFebruary blues shifted me to a snail gear with all of the small negatives in life just seeming to accumulate into giant problems. Thus, though posting a couple of weeks late, miss Candy came to my mind. Someone, who is always happy. Someone, who makes you happy just by looking at her. 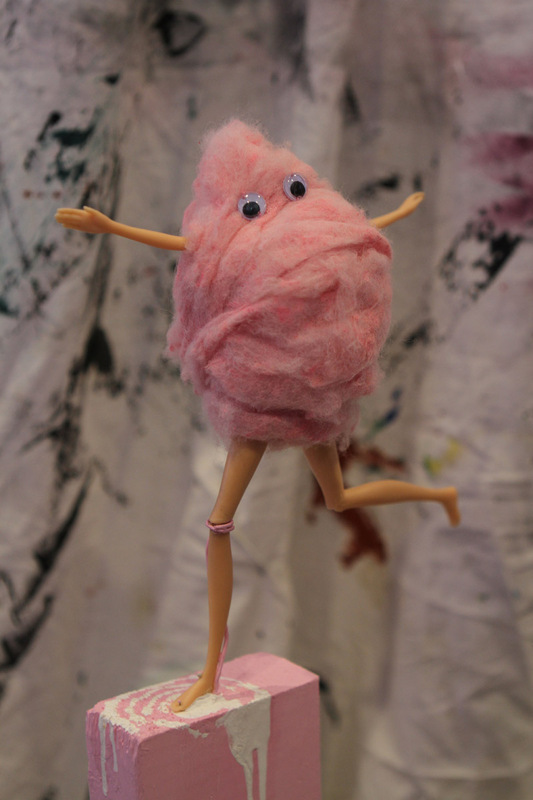 Here she is: miss Candy the cotton candy girl, topped with googly eyes and those perfect barbie limbs. Life can be sweet for you as well: available for $50 plus shipping. Posted on March 27, 2017 by Veera Pfaffli and tagged mixed media barbie sculpture sweet recycled veerapfaffli. This weeks Project describes the multiple layers of life and development of time. 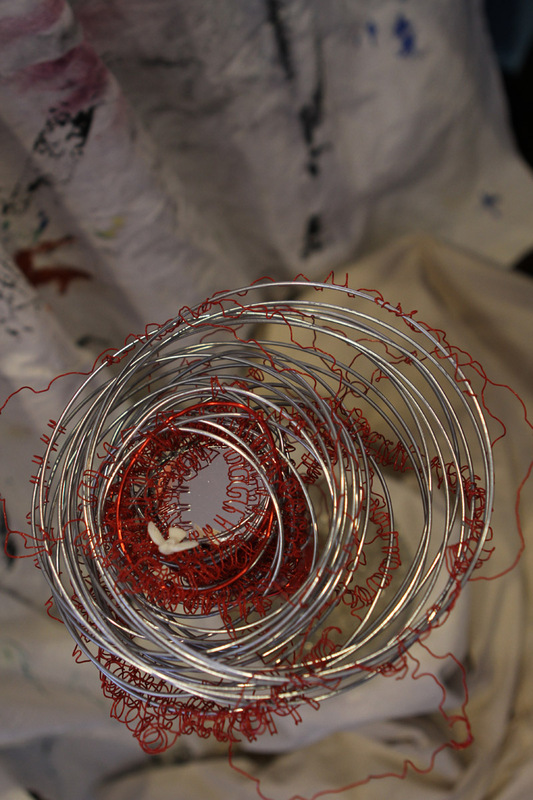 Constructed of recycled plastic bags and silver polyester thread infused together, wrapping around a metal thread skeleton and staples together, that just about wraps up our daily path. Posted on March 13, 2017 by Veera Pfaffli. Banana for the love of Minions is inspired by the Minion movie: I just had to generate the fabric interpretation that a lady in a yellow cab wears sewn into a modern dress - completely bananas. The fabric is available on my Spoonflower design gallery printed on many different fabrics from cotton to silk to faux suede, and for those who want the dress asap, Sprout has Anna-dress pattern as well as sewing service that ships globally as well available through this link. Go bananas! The life size banana on one yard of fabric consists of 16x16 inch repeats and 7 inch tall bananas, order here! Posted on February 19, 2017 by Veera Pfaffli. 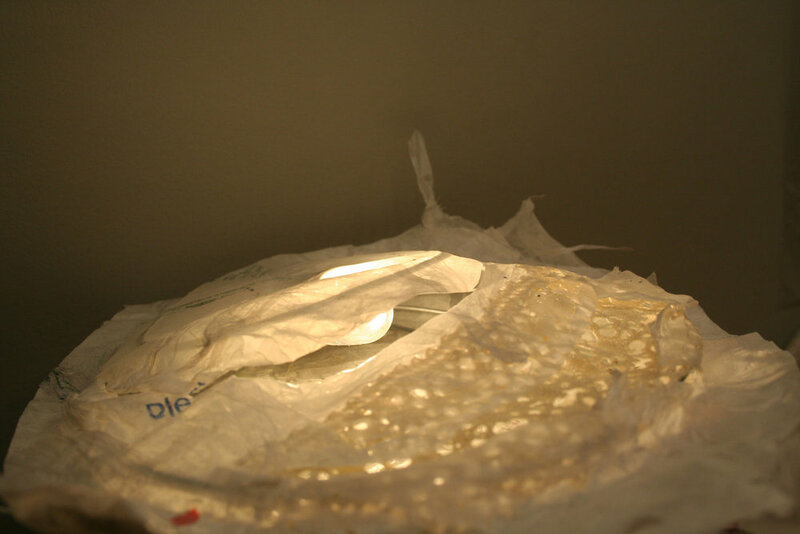 Handmade pieces of lace from my grandmother's tin box that I inherited are included in this LED-bulb fitted nighlight/moodlight, that can be hung, placed against window, or set on a shelf as the moment requires. My grandmother taught me how to sew and crochet, and a small tin box filled with her project laces, as well as some of her old sewing threads and hand-embroidered kitchen towels are still with me, and memories never fade away. Non-heating moodlight with changeable C7 candelabra based LED heart is available for $50. email Veera for any information! Posted on February 12, 2017 by Veera Pfaffli. A prayer of a poledancer is the first project of February. Posted on February 5, 2017 by Veera Pfaffli. Sleepwalker is a champagne bottle cap-wire sculpture by Veera Pfaffli. Posted on January 29, 2017 by Veera Pfaffli. Light confession is a mood/nightlight constructed of iphone 5 box and Christmas lights boxed in with a back panel. Front panel has perforated series of braille writing depicting word "confession". Available for $50, contact Veera for further information. Posted on January 22, 2017 by Veera Pfaffli and filed under trash sculpture and tagged iphone box christmas lights trash sculpture veerapfaffli nightlight braille writing confession. Abstract painting mercury with braille writing dots from 1.5mm foam core and silver acrylic paint dots has cool blues and glossy silver sides reflecting our daily emotional reflections. 24x24 inches with thick 3d profile, available for $300. Posted on January 8, 2017 by Veera Pfaffli and filed under braille code painting and tagged veerapfaffli braille painting code painting abstract art. With summer in its prime, old items continue my project of the week sculptures. Another wing, this time bent out of aluminum bicycle chain cover, that I found buried from the ground. 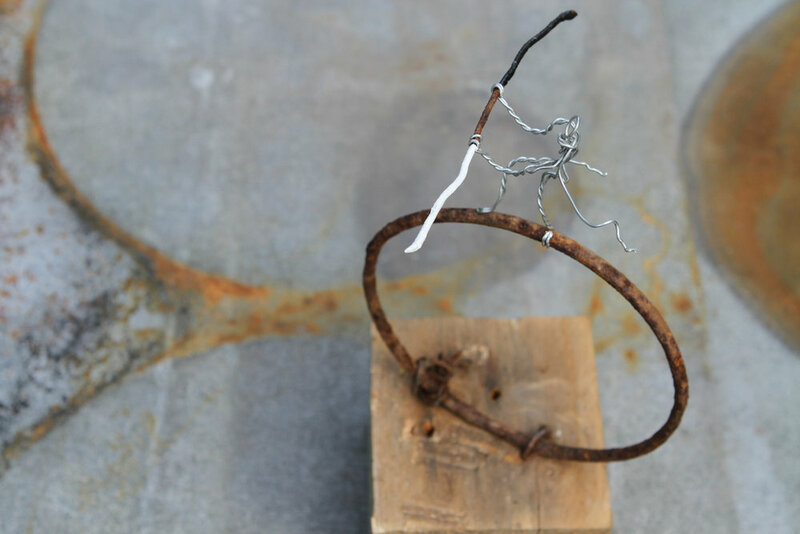 Driftwood piece from Gulf of Finland and rusty nail and piece of metal form the support for the sculpture. Size of the ‘Cycle wing’ is approx. 2.5ft x 1ft, available for $75, ships easily anywhere as it is light; contact Veera if interested! Posted on July 14, 2014 by Veera Pfaffli. 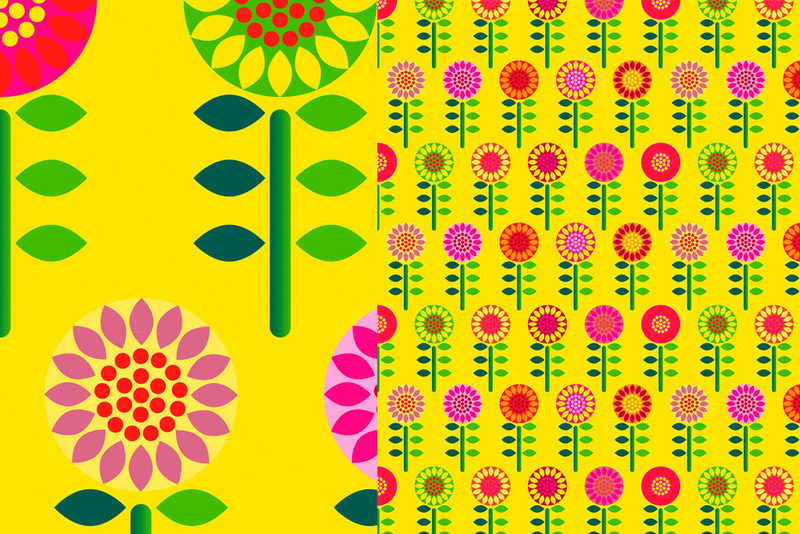 Sunflowers belong in summer, and this collection of 6 sunflower fabrics was inspired by Finnish margarine ad from the late '70s: 'what did we spread on our bread prior to Flora'. The margarine package was white with big, stylized flowers surrounding the container. Somehow it came to my mind while at grocery store, now seeing greatly changed Flora package. The Flora collection has three different colored sets: large and small patterns for white with bright colors, blue-teal cools and yellow-hot and pink flowers. 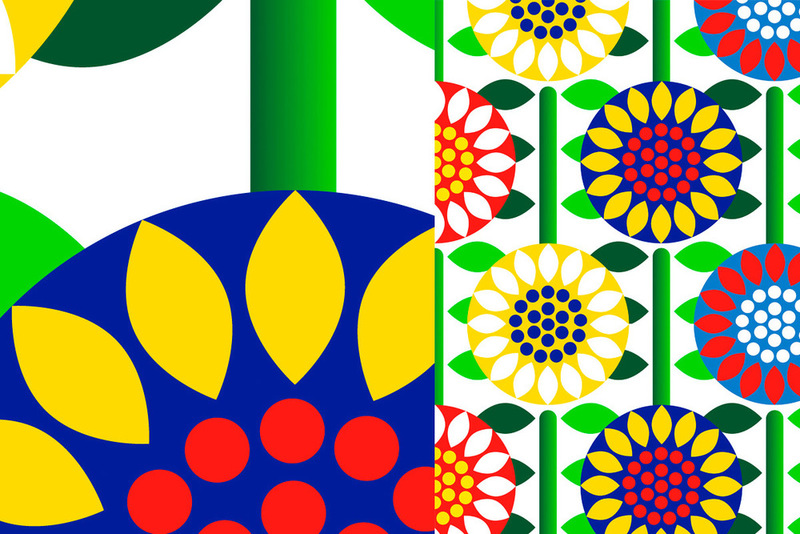 On each, the large patterns have the same layout with six inches diameter flower faces, but all three small flower designs have different patterns from straight to alternating lines with 1.5 inch wide flowers. All six patterns show beatifully, or should I say, smashingly together and are available through my spoonflower store printed on fabric or wallpaper.